As a teacher, chances are both your schedule and your school budget are stretched thin. You want to make your events bigger and better but how do you do it? Good news! You can do wonders with your events in just a little time and a it’s a lot easier than you think. In a single school year, there is on average at least 30 school events and happenings. Today we’ll show you some great ways that you can promote your school events that are quick, easy, and affordable. By utilizing some creative techniques and powerful tools, you can multiply the number of smiling faces in the crowd easier than you may have imagined. During a single school year, there are dozens and dozens of events for students and their families that you are tasked with planning, promoting, and running. From recitals to fundraisers to homecoming and everything in between. Each event requires its own tailored creativity, promotions and details to draw a crowd. The things that will get people to come to a weekday Homecoming basketball game are different than what will get people to come to a Sunday bake sale. But, many of the following creative tips and tricks can be shared between different kinds of events. By utilizing visually appealing and customizable strategies you can easily ensure that all your events are memorable. 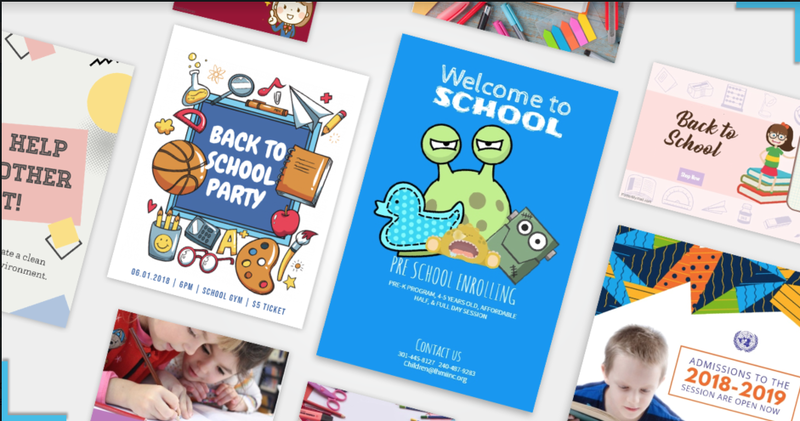 With the reach and availability of social media, professionally designed customizable templates, and grassroots marketing (think traditional paper flyers and handouts) there are dozens of effective ways to draw a bigger crowd to your school event. Today, with more and more people being highly active on social media, conventional grassroots marketing alone will not make the cut. It is imperative to have a visually appealing and engaging social media presence. Posters and flyers can quickly stop people in their tracks in the hall, while social media visuals can stop people from scrolling and take notice of your event. According to Statista, 59 percent of U.S. moms stated that they accessed social media several times per day. Online marketing, alongside an active grassroots marketing campaign, will create a dynamite combination guaranteed to get more people actively involved in your event. As you are scrolling through your social media channels I’m sure you’ve seen the abundance of creative hashtags. The explosion of social media over the last decade has brought quick and easy ways to filter the content that is shown to you. Insert the hashtag (AKA any word that comes after the # symbol.) The use of hashtags not only offer a way to show off your creativity and flair in a post, but also an effective way to make sure your post gets right in front of the people you are looking to attract. These days, a lot of your online promotion will be on social media. There’s no way around it if you want to maximize the promotion of your school’s event. So, get your creative juices flowing and come up with a hashtag that will get your likes and shares higher than ever before. James Clemens High School out of Alabama has mastered the use of creative hashtags. For one of their big games they utilized the hashtag #proudtobeajet to create a greater sense of team spirit. They also encouraged posts from students using the hashtag and showing why they are proud to be a James Clemens Jet. Studies, like this one from Simply Measured, have shown that the use of hashtags can increase engagement in your social media posts by 12.6%. You can also use your hashtag to drive active participation and engagement by encouraging your event participants to include the hashtag in their posts before, during, and after the event also. You’ll quickly find that you’ve built a community that is excited about your latest event. 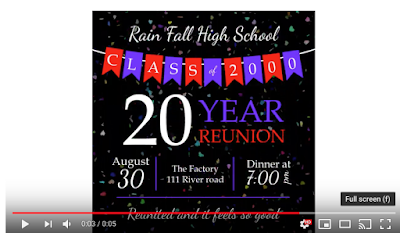 Homecomings, reunions, and many other school events are all about memories. Memories that often last with us forever. These memories play in our heads like videos. Give your students a head start on creating memories by creating fun personalized videos to promote your upcoming festivities. Videos tap into the emotional aspects of human nature like nothing else! Harness this power and create a video to demonstrate the memories made at your event in years past, leading up to this year’s event, and why EVERYONE should come. Get creative and grab some behind-the-scenes moments, event preparations, and the hype leading up to the event. The very thought of creating a video might intimidate you, after all, you are no expert at video production. Even if you don’t have time to capture some preparation footage you can still create a great video. With the help of professional video templates available online, you can quickly and easily create a video for your event by simply customizing any template you like. You don’t have to be a video expert! Another crucial event for any school or college is the Admission Drive. This is the time to go big on marketing and attract as many people toward your school as possible. This is the perfect time to sway parents away from your competitors and into your school. Attractive Admission Drives are imperative to keep your school running. It is crucial here to go all out on both conventional and online marketing. The important part is to get the word out about your school before the start of the academic year. You can do all this without spending thousands of dollars on marketing. 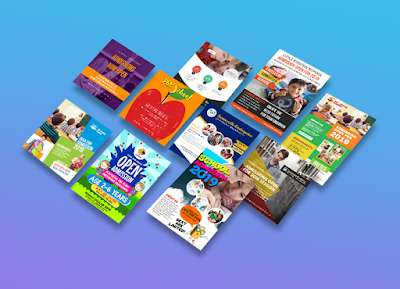 Take the help of professionally designed online templates to create engaging posters for both your online and offline marketing. Utilizing the power of social media, you can reach a targeted audience in your area that is sure to contain many new prospects for new students. If you present a memorable image for them, you are very likely to fill the halls on your next admissions fair. As a teacher, more than likely you have email contacts for almost every parent, faculty member, etc. for your school. This is a golden opportunity to spread the word about your upcoming event in fun and creative ways. Email inboxes are the second most frequent thing people are checking from mobile devices every day. everyone on the contact list. In a matter of seconds, everyone will have all of the important event details. Make sure the time and place are shown clearly and be upfront with all the event information. This is also a great opportunity to spread the use of that event video you made that we mentioned earlier. Include it in the event email also! You can utilize online tools like a free customizable online event registration form template, like this one from 123FormBuilder to make sure your form has all the necessary information and all of the information fields needed. Email automation applications like MailChimp can help you send out the email to your contact list as efficiently as possible, saving you time and resources. Getting people to come to the next school event doesn’t have to be just up to you as the teacher. Within the school, you have access to a huge group of people in the other staff members and administration as well as the students. From the Principle to the PE coach, everyone can and should be involved in promoting the event. 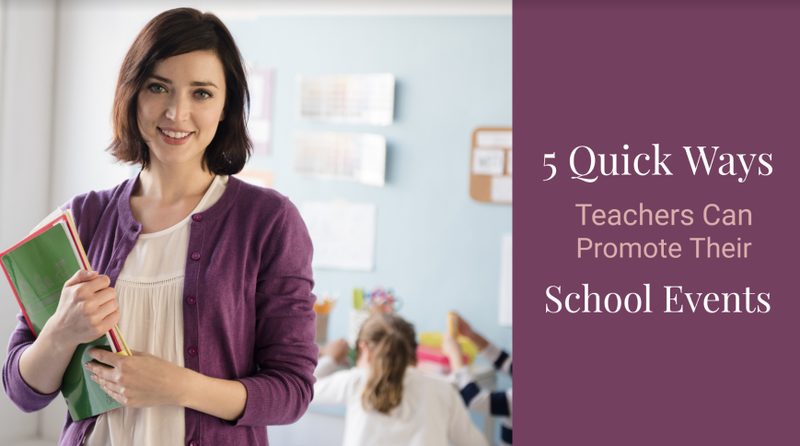 Work with other members of the staff to show them the importance of being a part of a positive, active, and focused school culture and environment. As a teacher, you know word gets around schools fast. Take advantage of this and use your team of co-workers to help spread the word! One fun and easy way to build a sense of community and school spirit before an event, especially a big game, is to have a homemade poster contest. Get the other staff to help spread the word and have each different homeroom, school club, or team create a spirit poster to hang in the halls. Show off the winning poster at the pep rally and present the winners with small gifts like school stickers, rally towels, or keychains. Then, you have a ton of spirit posters to display at the event as well! As you can see, there are dozens of creative ways to promote your school’s event, both in traditional ways and digital ways. 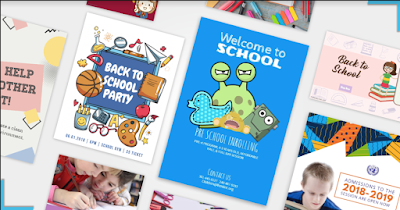 There are beautifully designed digital templates available online, like the ones from PosterMyWall, for all your school events. With today’s advancing technology, it’s easier than ever to create customized posters, flyers, social media graphics, videos, etc. to promote your event. This is sure to get both more students AND more parents in attendance. By harnessing the power and reach of social media, and using these eye-catching visuals for your events, you can now reach out to a much broader audience. It’s easier, quicker, and cheaper to promote your events now and you’ll still have ample time to plan your lessons.